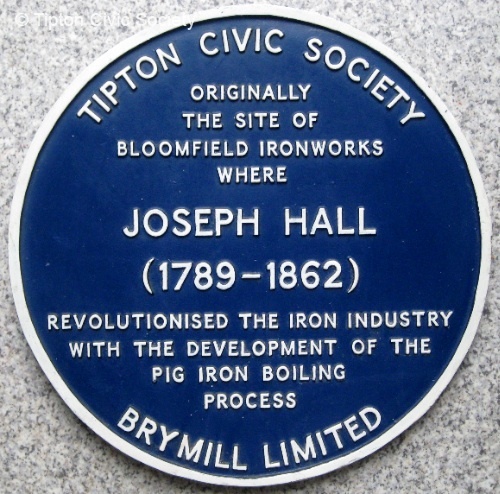 Originally the site of Bloomfield Ironworks where JOSEPH HALL (1789-1862) revolutionised the iron industry with the development of the pig iron boiling process. Erected 1989. Located on the Brymill works, Bloomfield Road. Removed 2006 due to the closure and redevelopment of the Brymill site. Re-erected 1st October 2010 on 1, William Barrows Way by David Wilson Homes. Removed June 2011 by house owner in order to repaint house but not replaced due to owner’s fear about theft. It was subsequently handed back to the Society. 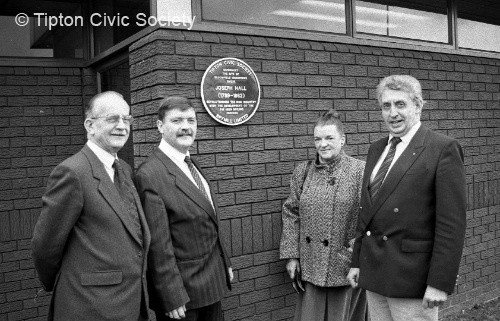 The original unveiling of the Joseph Hall plaque on 12th November 1989. L to R: Ron Statham (Treasurer), John Brimble (Chairman) and Angela Harris of the Tipton Civic Society, with Derek Evans, Brymill Director. 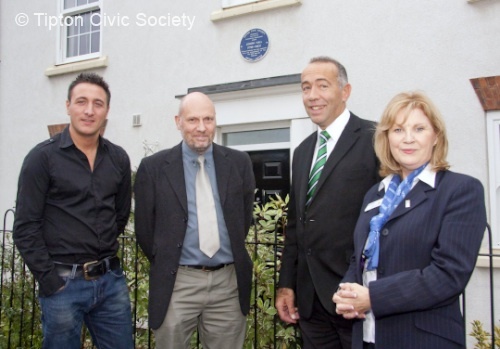 The second unveiling of the Joseph Hall plaque on 1st October 2010. L to R; David Brayne (householder), Keith Hodgkins (TCS Vice Chairman), David Wilson and Carol White (David Wilson Homes). Near this spot JOHN WESLEY preached several times between 1745 and 1752 and established the first Wesleyan chapel in Staffordshire on this site. Erected 1990.Located on the Tipton Green Methodist Church Hall, Park Lane West. Sponsored by Tipton Green Methodist Church. These premises were occupied from 1840 by Union Flour Mill and from 1909 by Tipton Conservative Club. Erected 1990.Located on Tipton Conservative Club, Union Street. Sponsored by Tipton Conservative Club. The unveiling of the Union Flour Mill plaque on 18th August 1990. 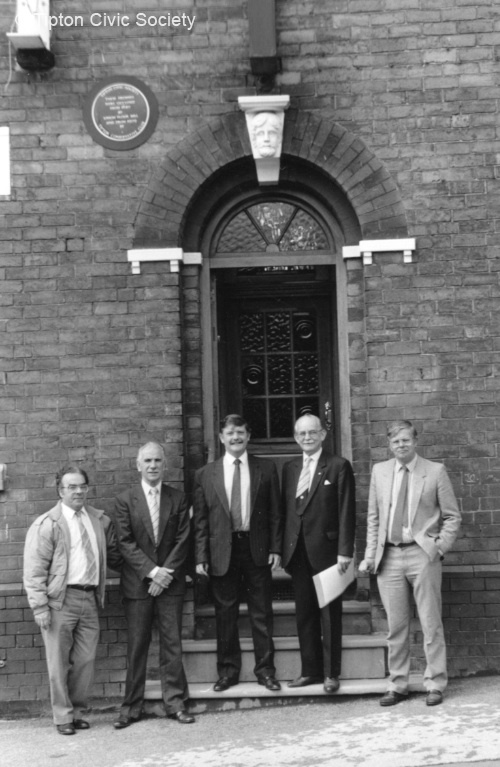 L to R; TCS members Barry Whitehouse, Joshua Churchman, John Brimble, Ron Statham, Neil Statham. From the 1820s to the 1950s the area between Bell Street and High Street was occupied by dwellings in Chapel Street, Chater’s Passage, Simon’s Passage and Wade’s Passage. Erected 1991.Located on Wards’ Poultry Ltd. Chapel Street. Sposored by Wards’ Poultry Ltd. Removed in 2003 due to the closure and redevelopment of Wards’ Poultry. 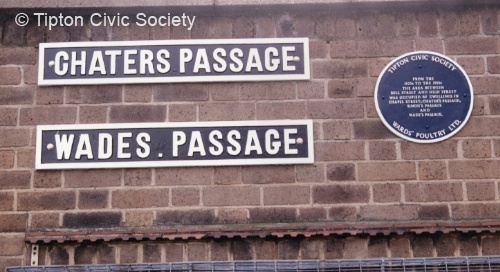 From 1991 to 2003 the plaque was displayed on Wards’ Poultry offices together with the preserved street nameplates from caters and Wades Passages. Following the closure of Wards’ the nameplates were put on display in the Tipton Community Museum. 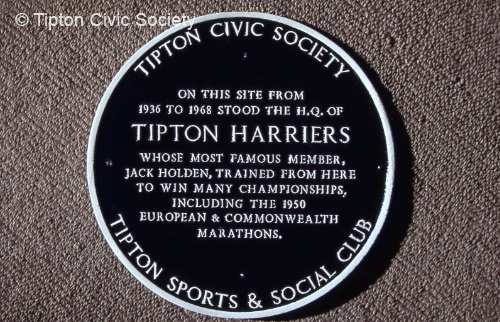 On this site from 1936 to 1970 stood the HQ of TIPTON HARRIERS whose most famous member, Jack Holden, trained from here to win many championships, including the 1950 European and Commonwealth marathons. Erected 1991.Located on the Tipton Sports and Social Club, Sedgley Road East. Sponsored by Tipton Sports and Social Club. 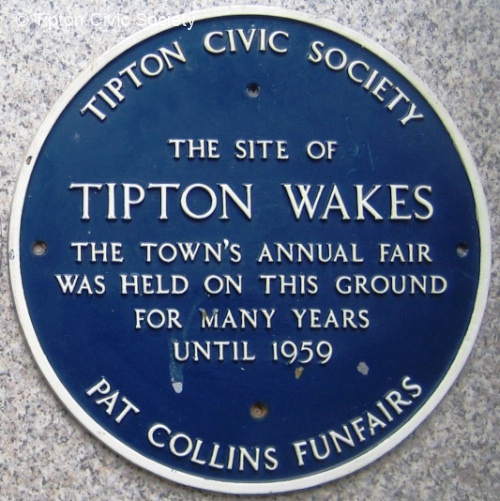 The site of TIPTON WAKES. The town’s annual fair was held on this ground for many years until 1959. Erected 1991.Located on the Health Centre, Queens Road. Sponsored by Pat Collins Funfairs.Removed in 1999 due to the closure of the Health Centre. Re-erected at 15, Silvertrees Road, 2009. JOSEPH DAVIES VC 1889-1976. Born Nock Street, Toll End. Awarded the VC for the most conspicuous bravery in action at Delville Wood on the Somme. 20 July 1916. Erected 1992. Located on the Nags Head, Market Place, Great Bridge. Sponsored by the Royal British Legion Tipton Branch. Removed 2015 following closure of pub. 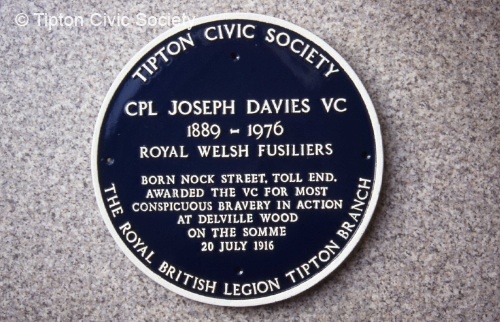 Re-erected on the Kings Arms, Toll End Road, Tipton and unveiled on 20th July 2016, the one hundredth anniversary of Davies`s heroic action, by his grandson Michael Howard. 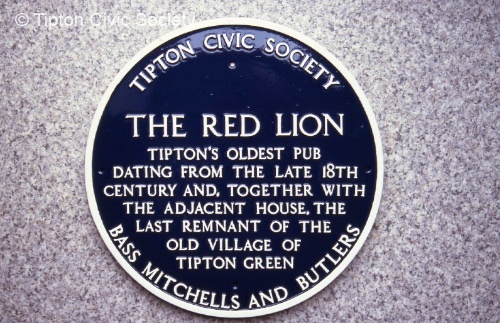 THE RED LION. Tipton’s oldest pub dating from the late 18th century and, together with the adjacent house, the last remnant of the old village of Tipton Green. Erected 1993. Located on the Red Lion, Park Lane West. Sponsored by Bass Mitchells and Butlers. 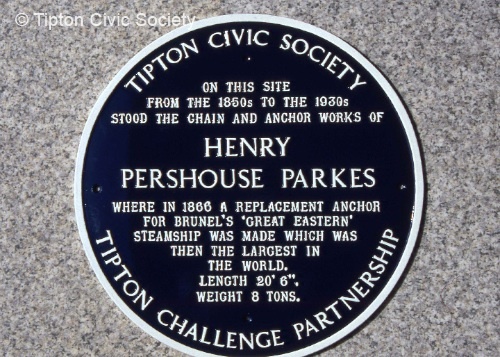 On this site from the 1840s to the 1930s stood the chain and anchor works of HENRY PERSHOUSE PARKES where in 1866 a replacement anchor for Brunel’s Great Eastern steamship was made which was then the largest in the world. Length 20’ 6’’. Weight 8 tons. Erected 1999. Located on the office of Smith Brothers (Quinton) Ltd., Castle Street. Sponsored by Tipton Challenge Partnership. 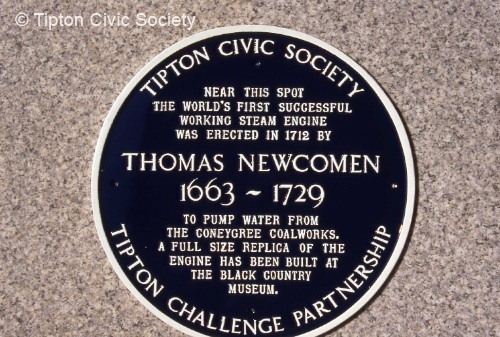 Near this spot the world’s first successful working steam engine was erected by THOMAS NEWCOMEN 1663-1729 to pump water from the Coneygree coalworks. A full size replica has been built at the Black Country Museum. Erected 1999. Located on the Coneygree Community Centre, Sedgley Road West. 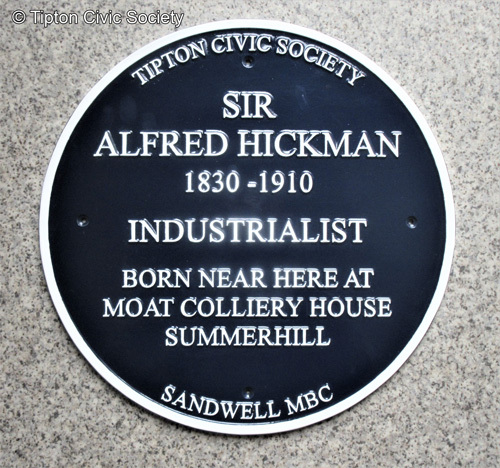 Near this spot at the junction of Lower Church Lane and Alexandra Road stood until 1912 THE TIPTON WORKHOUSE where local government in the town originated with the first meeting of the Tipton Local Board of Health.10 September 1855. Erected 1999. Located on Tipton College, Alexandra Road. JUBILEE PARK. 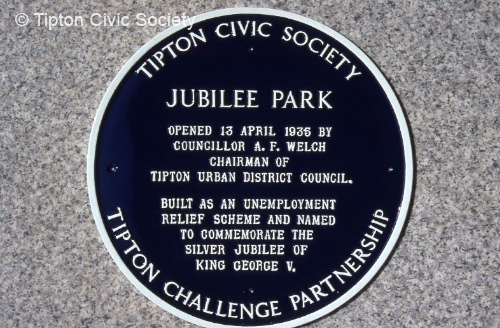 Opened 13 April 1935 by Councillor A.F.Welch Chairman of Tipton Urban District Council. Built as an unemployment relief scheme and named to commemorate the Silver Jubilee of King George V.
Erected 1999. Located on Jubilee Park Community Centre, Powis Avenue. Near this spot from the 1790s to the 1860s stood GOSPEL OAK IRONWORKS where in 1843 John and Edmund Walker made the cast iron columns for the Albert Dock in Liverpool. Erected 1999. Located on Tipton Sports Academy, Wednesbury Oak Road. 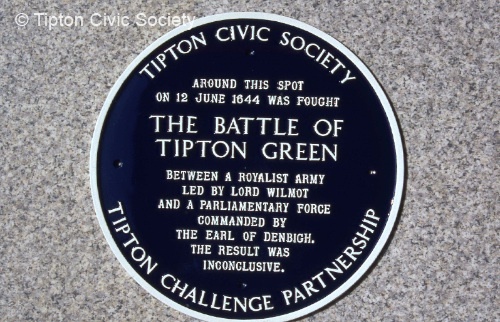 Around this spot on 12 June 1644 was fought the Civil War BATTLE OF TIPTON GREEN between a Royalsit army led by Lord Wilmot and a Parlaiment ary force commanded by the Earl of Denbigh. The result was inconclusive. Erected 1999. Located on Malthouse Stables, Hurst Lane. 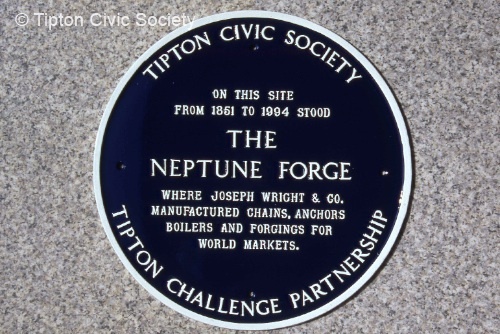 On this site from 1851 to 1994 stood THE NEPTUNE FORGE where Joseph Wright & Co. manufactured chains, anchors, boilers and forgings for world markets. Erected 1999. Located on the Neptune Health Centre, Sedgley Road East. Black Country Poet and Entertainer. Born Bloomfield Road Tipton. Erected 2012. Located on the Brook Street Community Centre, Brook Street. Sponsored by Brook Street Community Centre. Near this spot on 6th March 1922 occured the Dudley Port Explosion when 19 girls were killed whilst dismantling redundant WW1 cartridges. Their memorial stands in Tipton Cemetery. Erected 2013. Located on Tipton Toddlers Nursery, Groveland Road. 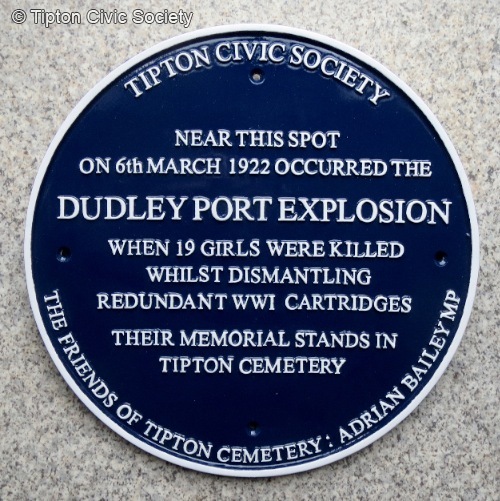 Sponsored by The Friends of Tipton Cemetery and Adrian Bailey MP. Unveiled by Adrian Bailey MP. 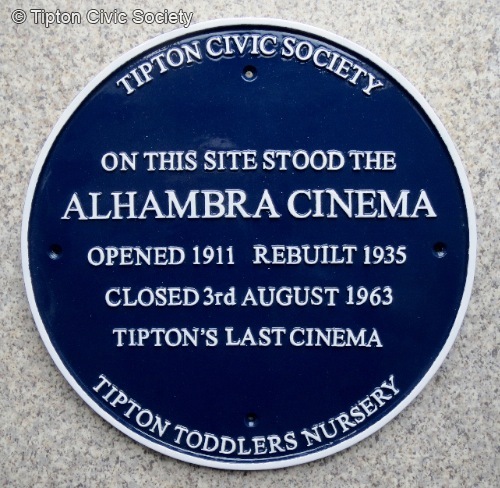 On this site stood the Alhambra Cinema. Opened 1911. Rebuilt 1935. Closed 3rd August 1963. Tipton`s last cinema. Sponsored by Tipton Toddlers Nursey. 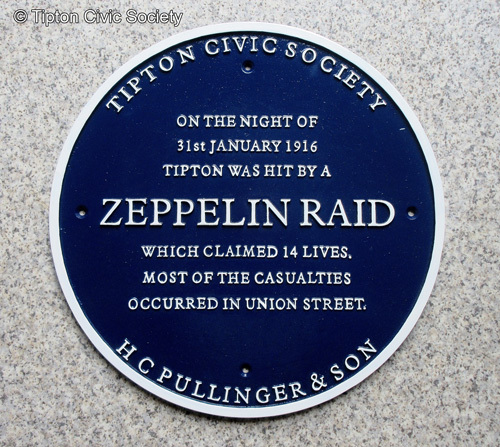 On the night of 31st January 1916 Tipton was hit by a Zeppelin raid which claimed 14 lives. Most of the casualties occurred in Union Street. Unveiled on 31st January 2016, the one hundredth anniversary of the raid, by Adrian Bailey MP. Located on the premises of H C Pullinger & Son, 30, Union Street, Tipton. It was around this spot that three high explosive bombs exploded at 8pm on 31st January 1916. Sponsored by H C Pullinger & Son. The inaugural meeting of the Black Country Society. President Dr John Fletcher (1934-1996) Secretary John Brimble (1940-2006). Held at the Noah’s Ark. 1st March 1967. Unveiled on 1st March 2017 by the founders’ widows Mrs Pauline Fletcher and Mrs Doreen Brimble, the 50th anniversary of the Society’s inaugural meeting at the Noah’s Ark. Located on the Noah’s Ark pub, Wood Street, Tipton. Sponsored by the Black Country Society. 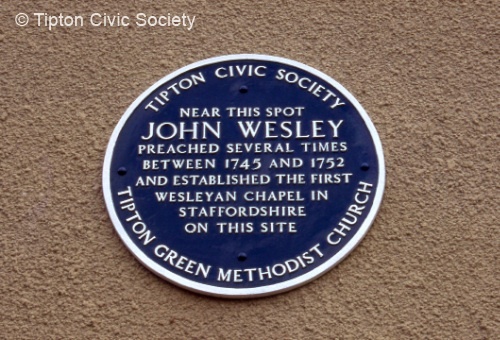 John Brimble was the founding father of the Tipton Civic Society in 1988. 1864-1933. Artist. Born near here at Moat Colliery House, Summerhill. Unveiled on 4th June 2018 by Councillor Bill Cherrington. Located on Glebefields Library, St Marks Road, Tipton. 1830-1910. Industrialist. Born near here at Moat Colliery House, Summerhill. Such a lot of history and I'm sure there's lots more. 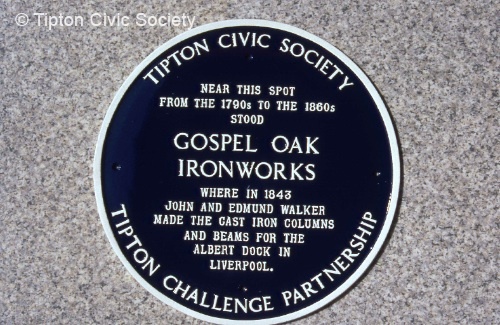 Looking forward to having a drive or walk around to find the plaques and get to know Tipton better. Would love to know if there is a book available. 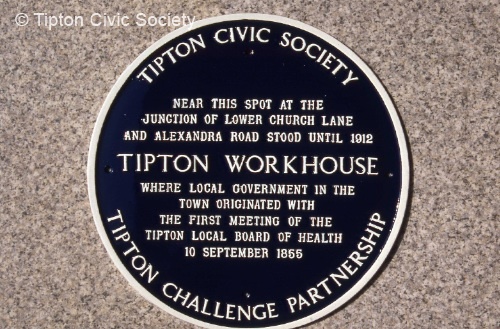 Also looking forward to getting along to some of the Tipton Civic Society meetings to hear about Tipton's past. 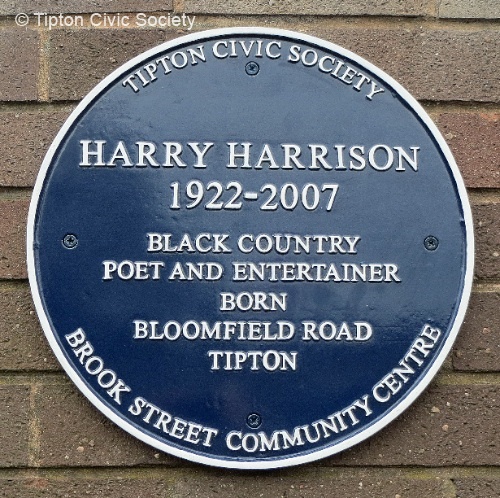 The Tipton Civic Society was set up to promote interest in the history, heritage and identity of the Black Country town of Tipton. 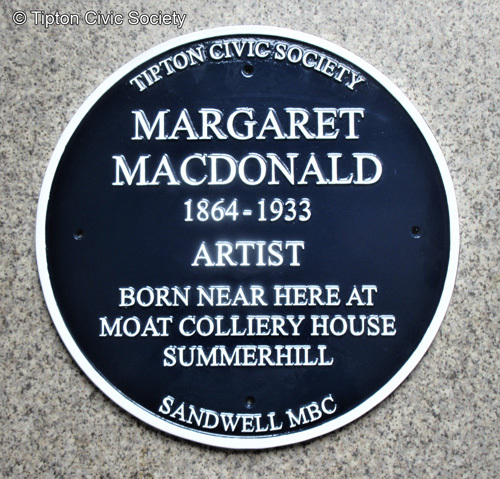 Website contents © Tipton Civic Society 2014—2017. All Rights Reserved. 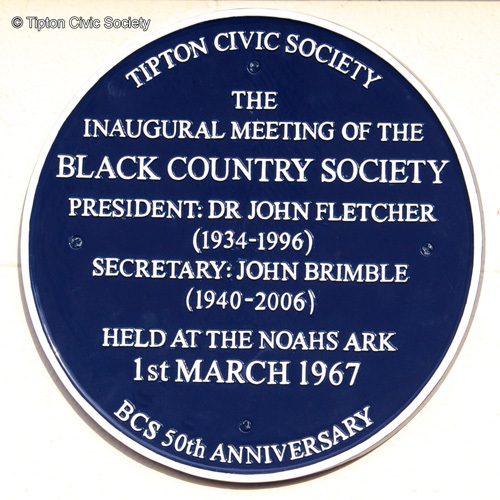 All Contents © 2013 Tipton Civic Society. Picture Window theme. Powered by Blogger.